I've always found cotton very appealing for summer suits, but historically haven't had much luck with them. I had a navy one made by Choppin & Lodge, but the make was really too English and structured for the material (my fault, not theirs). And I had a green one from Madrid's Reillo last year, which had an issue with the shoulders (their fault, not mine). 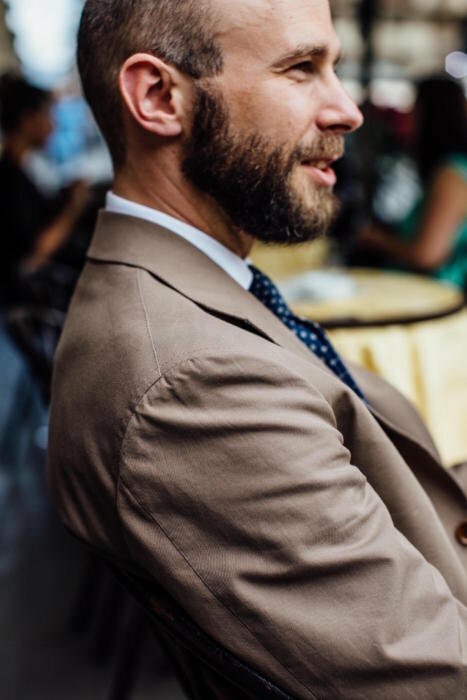 This summer, I planned for a suit and a jacket in cotton - the suit from Elia Caliendo (pictured here) in a soft Neapolitan style, and the jacket in a double-breasted Milanese style from Ferdinando Caraceni (details next week). Cotton is very cool in the summer, particularly if fine and lightweight like this 9oz from Holland & Sherry (276009). It will wrinkle, but not as much as linen of the same weight. And it is very comfortable, perhaps more so that most linens. The sartorial disadvantage, of course, is that cotton won't drape or hold a line well. It is disliked by tailors for this reason - it is not really considered something you can 'tailor' in the same way as linen or wool. Cotton's other big disadvantage is that it has no natural stretch. A tight fitting cotton suit can be pretty uncomfortable, and this Caliendo was cut a touch bigger in the waist and thigh to accommodate that. So several disadvantages. But there is one more - something a cloth merchant or mill will often list as a disadvantage, but I consider anything but. Cotton is rubbish at holding dye. Wool is great. Absorbs it, holds it, won't let it go. But cotton is not. This is why jeans fade, why denim shirts look great around the seams, and why chinos are usually garment washed. That resistance to dye is annoying for a mill - it makes the colour harder to control. But for the consumer, it means the particular suit or jacket will age beautifully, developing a patina around the exposed areas and seams. And given that one of the big themes of Permanent Style is making tailoring relevant to a modern, more casual audience, this ageing is very appealing. You can accelerate the process with how the suit is pressed, too. Some Savile Row tailors used to press cotton suits when they were damp, in order to lift out some of the dye out of the folds and seams. I wouldn't necessarily recommend doing this on a full suit at home, but you can see the effect if you dampen the crease on a pair of cotton trousers (perhaps with a sponge) and then iron them (always best to start with a tea towel between the iron and the cloth). The crease will lighten slightly, and do so more the more times you iron them. As to this suit, it was beautifully made by Elia Caliendo especially for our Young Tailors Symposium last month. It was only quarter lined, with a piece of bemberg across the top of the back. And the sleeves were left unlined (something I wouldn't recommend on many cloths apart from cotton). You can see below how the cotton of the sleeve has been turned back inside, and without the lining in between, the pick stitches show through slightly on the exterior. Like a join-the-dots gauntlet cuff. Elia also convinced me to go for corozo buttons, which I normally avoid. The Italians usually default to them, but generally I think they look too plasticky - without the textural appeal of horn. But lighter colours of corozo like this tan have more texture - the 'waves' are much more visible. And tan worked nicely with this suit. 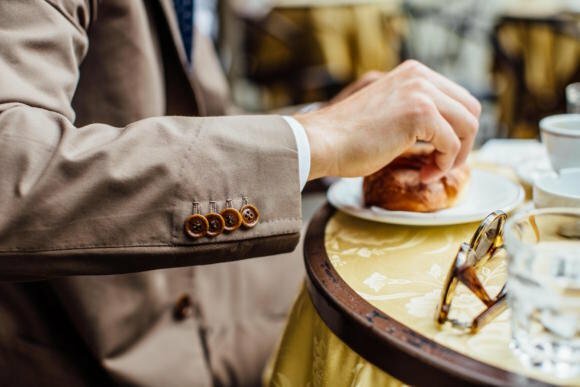 Photos in Florence by Jamie Ferguson, taken during a meet up of the 'Ten most Rakish men'. George Wang of Brio above, and Ethan Newton or Brycelands in the background below. Tie from Drake's, shirt from Luca Avitabile, handkerchief from Simonnot-Godard. 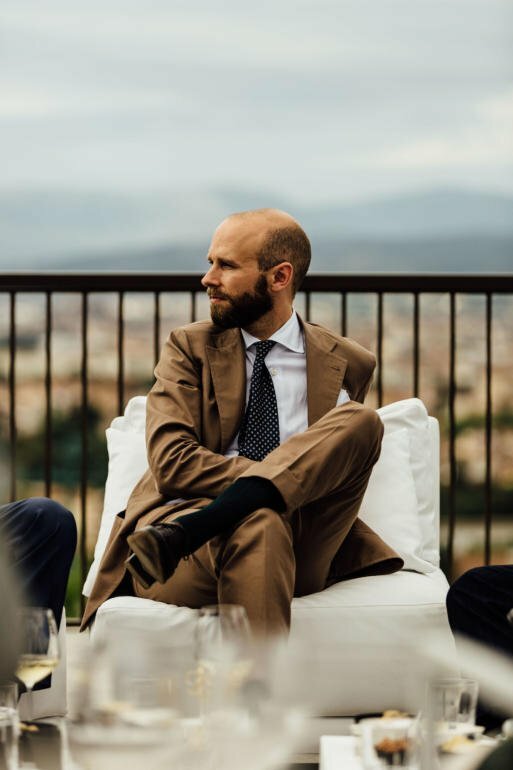 You can follow the discussion on The appeal of the cotton suit – bespoke from Elia Caliendo by entering your email address in the box below. You will then receive an email every time a new comment is added. These will also contain a link to a page where you can stop the alerts, and remove all of your related data from the site. I am not really a fan of cotton – especially for a jacket. I would prefer wool or linen on almost any possible garment. 1. A jacket can’t be washed as often as a shirt. Which eventually leads to cotton jackets to be much less hygienic and more smelling than wool jackets which are much more odor resistant and can be aired efficiently. And as far as you would wear cotton in the summer – exactly when you sweat the most, it makes little sense to buy a cotton jacket. 2. Cotton jackets have for me too much the look of a RTW garments. It is because cotton is usually the cheapest natural material and RTW brands like Zara ect produce a lot of cotton jackets which corrupted the look of cotton jackets too much in my mind. Nothing really appealing in the look. Thanks, and I can see both points. Cotton will certainly take a little looking after from that point of view, and isn’t great if you sweat a lot into the jacket. As to RTW, I actually find these don’t tend to look much like RTW garments at all, because RTW cotton is all washed and treated. Plus, I guess, I like the appeal of having something that could perhaps be RTW, but just looks better – better fit, better cut etc. A little like bespoke jeans. I love this suit. I work for a large park district, and on any given day I might go from a business meeting with vendors, to a field visit in a muddy field or construction site and back several times. I’ve found that this more casual style keeps me from sticking out too much in either situation. I agree about the drawbacks on the appearance & aging of RTW cotton – it’s a definite source of frustration for someone who has champagne taste and a beer budget. Hristo says a cotton jacket cannot be washed as often as a shirt but he doesn’t explain. You Simon didn’t mention how you intended or how you clean your cotton suit jackets and cotton jackets. Discoteque dancing sweat resultet in pilling and orange skin surface of the sleeves of my Fox Queen’s Award lightweight flannel jacket, but I do disregard N&L’s cleaning instructions for my linen jacket to remove sweat by soaking overnight and handwash. My eye has been online from abroad on various RTW cotton jackets in England (I don’t speak Italian) but a Oliver Brown salesperson wrote me their cotton from that other famous English mill creases like linen. – I don’t understand the widespread aversion to Lycra for stretch? your comment was a mixture of several questions and comments. I would tackle 2 of them. 1. Why you can’t wash a jacket as often as a shirt. I wash my shirts after every wear. Sometimes I use 2 shirts per day if I have some event in the evening. I can’t imagine that it would be a good idea to wash a tailored jacket every day. – A tailored jacket has inner construction with a mixture of canvases, horse hair , interlinings ect. which I guess it is not good to wash very often. I can’t explain my suggestion. Maybe it is wrong and maybe Simon can explain it better. – A tailored jacket receives a lot of its shaping from many hours of pressing work. When you wash it, you might impact this shaping and you(or the dry cleaner) might not be able to press it in the way a tailor would. So you might lose the shaping of your jacket. – This one does not concern cotton, but I would mention it anyway – a wool jacket should not be washed often because wool contains natural oils which are attacked by detergents and are washed away which causes the wool fabric to lose its properties. This is why it is recommended to wash a wool jacket not more frequent than 1 to 2 times per year. There is one thing I would try in the future – you can order a completely unstructured linen (or cotton) jacket at a good bespoke shirt maker, which has no inner structure at all (like sahariana jackets). This would be slightly smarter than a shirt, much less smarter than a proper jacket and it might be as washing friendly as a shirt. 2. Regarding the peeling of the Fox Flannel Queens Award lightweight flannel. To be honest – I love the colours that they offer. I would have ordered 3 or 4 of the colours for trousers if they were in a proper weight of around 400g. But they are not. Flannel is usually a sensitive fabric. And when you do it as insanely light as the Queens Award range, you simply can’t expect that it would be particularly durable. Hence the peeling is more or less expected. Ask your tailor on how to deal with the spots. P.S. I am 27 and I love dancing in a jacket. Flannel is not the best choice. Too hot and not breathable. Get a fresco or fresco-like mohair mix. An absolutely beautiful suit Simon. The colour is just spot on. I imagine that at midday it looks sandy and light and as the sun sets it takes on an earthier, deeper tone. When having a cotton suit altered last year the tailor recommended leaving the sleeve and leg length just a fraction longer than normal because, as you say, the lack of stretch and drape means you get creases in the elbows and knees which causes the suit to ride up a little. Would you agree with that? Or should the more generous cut that you advise take care of this? How does the construction of the jacket compare to a typical Boglioli cotton jacket? Completely different – full floating canvas, hand padded; hand-sewn collar; soft full shoulder pad. A normal lightweight bespoke Italian suit, essentially. What do you think about a cotton basket weave? I am thinking about a navy DB jacket but as a 4×1 to make it look more casual / with a more open chest (similar to the white Edward Sexton jacket you posted in the ‘Double Breasted’ topic a few weeks ago but with less structure, rope, etc.). I suspect the basket weave will make it even more breathable? I saw one in a bunch and thought it would look and feel pretty cool especially for summer. Do you think a winter version of this suit in a heavy weight moleskin would work? I would disagree that moleskin doesn’t hold its shape or line. I find it does far more than other cottons due to its greater weight. However, the idea of a whole suit from moleskin doesn’t appeal personally, trousers yes, jacket not so much. Very nice suit with good detail. Your comment about the buttons reminds me to ask why horn buttons leave a white/shiny effect on the coat cloth over time which when undone, makes the receiving end of the coat look scruffy/dirty. It does brush off to a degree but i find this most unfortunate. Any suggestions as to how to get rid of the marking? Does corozo have the same effect? Beautiful suit mate. The first summer suit I had done was a tan cotton, and I loved it…to death. I went one summer without one and had to add it to the queue of clothing. I agree to all the points you stated, and to some it may not be for them. I would also like to add that you are 100% on “oversizing” it a bit. Though all my suits are cut the same way, the cotton is a bit bigger and it honestly the most comfortable suit I own. To the gent who asked about the sleeves, mine I believe are the same length as all the rest of my jackets with no noticeable difference in sleeve length at the end of the day. Another aspect of oversizing is if washed, cotton shrinks. This is a lovely suit! As to its color, your choice is spot on indeed! You can expect it to age beautifully to a certain point. Now due to the style of the jacket, I wonder whether from time to time you couldn’t wear it as a separate. Finally, what do you think of linen & cotton mixed fabric for a suit like this one? The best weight, advantages and disadvantages? I don’t like cotton for suit or jacket,with a exception: the seersucker cotton. I have two suit and a coat (bespoke) in seersuker and work very fine in hot summer; hare porous and not wrinke much. I feel cotton incomfortable and too much consumable for a suit. However,i have see a old Italian bespoke suit of 60s in a blend of cotton with a bit of terital (the Italian dacron),i don’t know the percentage…i think around 20%. The suit was used,but still new, comfortable,fresh and crisp. Maybe in the case of cotton,the hatred for the “man made fiber” could be revised. Your thoughts on cotton blend (I.e. Polyamide aka nylon). Would this help alleviate problems around creasing and issues of lingering body odour ? I’ve noted even ‘higher end brands such as AMI using cotton blend in their jackets. Or are you a natural fibres purist ? I don’t think there’s a specific place to query this one: I have a pair of suede nubuck shoes that are an off-white (ivory) color. They have light scuffs. Do you have any experience with dyeing shoes? Any sense of whether a good cobbler can dye a pair of ivory shoes to – say – tan or medium brown? My wife has had handbags dyed – even by reputable places in NYC, and the effect has been: A) it doesn’t last long (the color washes out quickly), or B) the coloration looks uneven. I’d really appreciate hearing from anyone who’s had experience. Hello Simon! Great post! Any chance of a separate post on the A&S cord suit? Betcha it looks nice for the first week or two. In a couple of years you can use it to polish your car after the rain, ‘cuz it will look like a rag. I prefer linen but — far better — mohair, for a summer suit. Cotton is junk, except for shirts and underwear, of which one may have many. Couldn’t disagree more. Wait for next week’s post. Cotton jackets looking even better after 30 years…. I think that cotton suit for summer are a bit underestimated. Do you have any experience with the Kapok bunch from Scabal ? I have a suit made with a kind of caramel Cotton and Kapok suit, that I really love. Quarter lined as yours. Kapok help to maintain the shape of the suit, give an interesting feeling to the cloth and also make the colour just more beautiful and complex. What about the so-called British Panama suit cloth – would you say that’s synonymous with cool wool and lightweight wool, and wouldn’t you equate its summer comfort to cotton? 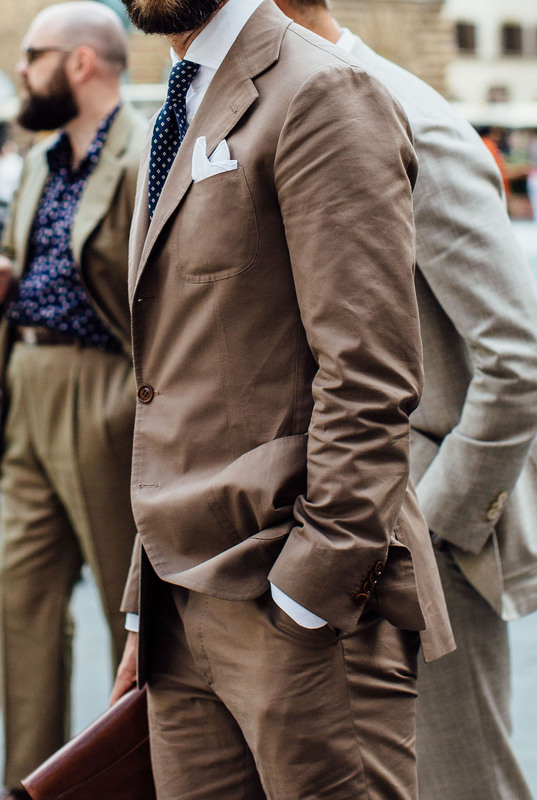 Two comments – I had a nice Italian beige cotton suit, but it got ruined last summer, when it was too hot on the continent and my sweat destroyed the color of the trousers. From beige into greenish – color stability of cotton was not good enough. Second thought – what type of suit and especially what color fits to a person with cold complexion (i.e. cold skin type, blue eyes, medium brown hair) – blue, obviously, but I want to go beyond (the tone of beige of that other suit never looked really good with me)? Love the colour and make, really excellent taste. Can I ask you why you’ve stuck to 3 roll 2 with all the jackets Elia has made for you? I’ve noticed that other neapolitan tailors have the third button almost hidden under the lapel is that just a matter of style peculiar to the tailor? If you were to change to 2 button would the lapel get longer to create a greater open area or would the button positioning change to keep the proportions the same? I really look forward to every jacket/suit commission that you write up and I have honestly learned a lot over the last few years! I think some of the newer bamboo fabrics would give you a similar look to cotton but with none of the many disadvantages already cited here. Purdey uses a 3 roll which I have in two models, one is action back. I just bought RTW CT 9 ounce British Panama wool suit jacket for disco dance and sweat because I don’t want cotton creases. If I wanted to have just a jacket made in cotton would this particular fabric be versatile enough (in terms of colour and texture) or is there another you would recommend? How often would you have to a cotton suit cleaned and pressed compared to a wool suit? Simon, even if creases soon inevitably reappear, don’t you as clothesman expert have one of those English steam gadgets about which I heard from English sources they remove creases so you can freshen and flatten the cotton cloth before each wear? And at least with wool, these steam gadgets can damage the shaping of the suit by removing the shaping which was achieved by the tailor by pressing. Favourbrook website “Care & Maintenance” suggests shower steam which I reject as moist, Willy Tattersall of Regent Tailoring wrote me they use SuperSteamer, but I can’t locate the website. Favourbrook says as I understand the danger Hristo has in mind is caused by ironing. have a look at the StyleForum Thread “GUIDE TO TOUCHING UP YOUR SUIT WITHOUT WRECKING IT”. RTW and MTM brands and stores are in my opinion not the best place to pick an advice on taking care of bespoke clothes because their garments are produced without investing many hours of pressing to achieve the shape. You can’t ruin the handmade stitches and the shaping of a suit which has no handmade stitching and little shaping. Bespoke tailors may have some kind of attachment to their work (its 60-80 hours of hard work to produce a suit) and it is likely that they wish sincerely that your suit lasts forever. For RTW and MTM brands and shops there is on the other hand little motivation that your garments last forever. They must only last approximately as long as the rest of the RTW/MTM competition so that you buy your next suit soon. 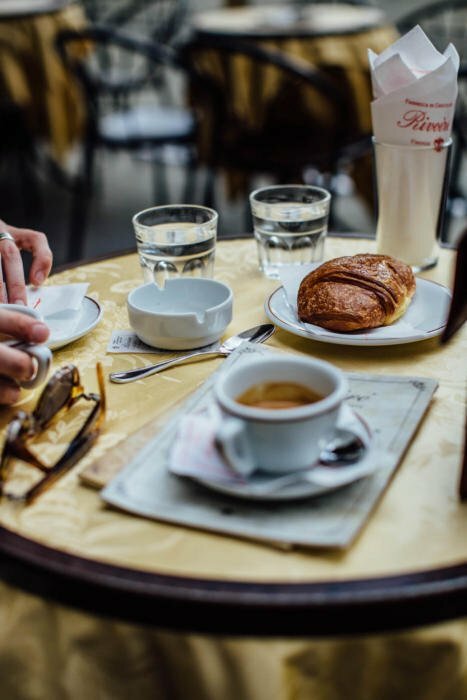 Hristo, I can’t afford bespoke yet and don’t understand Italian yet, but I am very grateful for all you, Simon and others write. Beautiful, pittoresque pictures and a magnificent suit! What materials of tie and handkerchief are best worn with cotton? what’s your experience of the practicalities of wearing this cotton suit for work? Since you work at the office, does this suit tend to be too casual? Do you use them as much as other casual suits, e.g. in comparison to your tobacco linen suit? I don’t find cotton as a material too casual at all, no. This colour is obviously more casual than, say, navy, but it is still quite versatile because it is relatively muted. I wear it to the office happily where I wouldn’t wear the tobacco linen. The latter is too strong in colour and therefore showy. The warm weather in London this week has made me think of commissioning a casual cotton suit similar to what you have had made here. I had a look at the H&S site and noticed that many of their classic cotton collections are 98% cotton with 2% stretch. With regards to the 2% stretch, would there still be the requirement to have the suit cut a little bit larger as you mention above (due to no natural stretch with cotton)? I also assume that this 2% will add a bit more durability too?? I would avoid the stretch if you can, personally. But yes, that would avoid some of the wrinkling issue. Simon, would you be able to do run a brief post on how your suits age with time? Would be good to compare wool vs cotton vs linen. I am particularly interested in your navy Choppin & Lodge cotton suit that may show fading/worn marks on edges or other part that are affected by rubbing due to seating at work desks, wallets, messenger bags etc. Thanks! Out of curiosity, you have used a number of tailors from Napoli – do you still commission from your first 2 Sartorias, namely Solito and Caliendo? Would the trousers from this suit work with a navy hopsack jacket or a cream linen jacket? The 9oz weight, is that per m2 or per meter of fabric length? I’m looking at having a cotton suit made by luxire, and looking at a 6oz/m2 cotton/linen blend fabric – would that be too thin and lightweight you recon? I don’t want it overly thick, but shouldn’t be thin as a shirt either. Hi Simon – I recently had my first cotton sports jacket made (in olive) and love how comfortable it is. Can you comment on how navy cotton fades? In a darker colour like this, is the fading still appealing in your opinion? Also, on cotton suits, is it harder to keep the pattern consistent across the trousers and jacket when wearing as separates than with other materials? Navy cotton will show fading noticeably (it happens much more on dark colours). I like it a lot, but it is a personal thing. I’d suggest you go for it if you’re happy with the idea that it will look more worn-in and less smart over time. Like good jeans, unlike a normal business suit. I’m not quite sure what you mean on having the pattern consistent. Could you expand on that? Couldn’t find where to comment on your reply on 6oz/m2 comment. Isn’t width of fabric roll normally 1.4m roughly? Then 6oz/m2 would be roughly same as 9oz/length meter, or am I wrong somewhere? Thanks! Hi Simon – sorry I meant the colour rather than the pattern – so would there be a higher risk of the jacket fading faster than the trousers or vice versa than with a different material where overall levels of fading are lower?